Born 1906 (d. 1991) Toller Hollow near Vanceburg, Lewis County, Kentucky. Charley Kinney lived his entire life on the property on which he was born and raised. Upon the death of the patriarch of the family, Charley and his brother, Noah inherited the family farm where they raised tobacco as a cash crop. His brother Noah married and moved to Flemingsburg, Kentucky. Charley lived a rugged life alone and void of many conveniences. He used the resources nature presented to sustain his life. These resources included the fueling of his imagination which led to the spinning of stories about local history, legend, and lore. His stories were conveyed not in words but through his drawings and paintings. His drawings often depicted wild beasts, real and imagined, as exemplified in his grisly "Wild Cat" "Wild Turkey," and "Hot (hoot) Owl." Many of his paintings were of "haints" legendary creatures which personified obvious evil. He was told they resembled tasmanian devils. They were dark images that even to the educated convey a fictional yet irrational terror. He also painted images of mountain men, moonshine stills, dirigibles, and flying machines. Some of his paintings illustrate simpler times of wonder and innocence. The paintings often contain verbiage, sometimes phonic-ly spelled. Specific examples we have seen tell "stories" of times when traveling circuses came through town. The townspeople appear to stand in awe of the bravery and mastery of various circus feats. We have a Charley Kinney painting we purchased from Larry Hackley titled "Walking War (wire)." 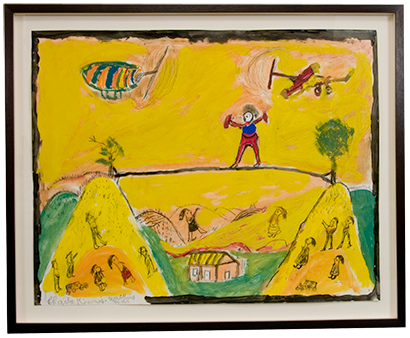 The colorful joyful piece shows a figure in the act of walking a "tight" rope as it appears to have been "strung" between two mountains. Also present is a flying machine and zeppelin. We subconsciously see a smiling face in the composition, and it does elicit a smile from within. Larry Hackley curated " An Eden of Their Own: Charley, Noah and Hazel Kinney of Toller Hollow, Kentucky" at the Moreland Art Gallery at Transylvania University in Lexington, Kentucky in the fall of 1999. He asked if we would please lend "Walking War" for the month long exhibition. The show was filled with work, from Hackley's extensive collection, as well as that of Maggie and Richard Wenstrup. The work was created by Charley, his brother Noah and Noah's wife Hazel. It was no doubt a significant retrospective of a rich body of work made by this close knit, talented yet simple living trio. 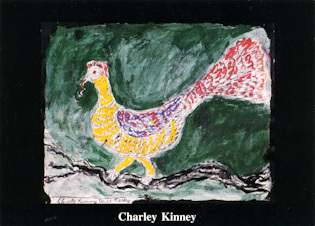 Kinney's work was included in Local Visions: Folk Art from Northeastern Kentucky, Morehead State University, Passionate Visions of the American South, New Orleans Museum of Art. Slow Time: Art by Charley, Noah, and Hazel Kinney, O' Appalachia: Artists of the Southern Mountains. The first one-man show of his work "Terrors, Holy and Otherwise: Works by Charley Kinney" was curated in 1992 by Julie Ardery at the Rasdall Gallery at University of Kentucky. His work is also in the permanent collection of the Huntington Museum of Art, West Virginia, Kentucky Folk Art Center, Morehead, Kentucky, Owensboro Museum of Art, Owensboro, Kentucky, New Orleans Museum of Art, and Birmingham Museum of Art, Alabama.